Bezel settings – that is, settings wherein the metal of the band encompasses the edge of the gemstone – have a long and rich history in the metal smithing and jewelry-making professions. 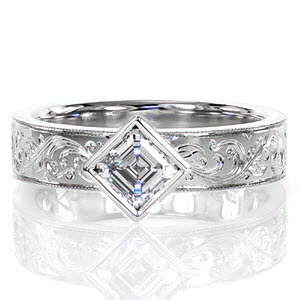 As a matter of fact, the use of bezel settings was one of the first ways in which metal smiths would set gemstones or diamonds into jewelry, as evidenced by many ancient heirlooms in public and private collections. 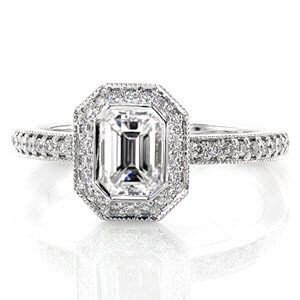 But, bezel settings have practical advantages for the modern jewelry we design here at Knox Jewelers, too. While prong settings are the most common and popular settings for most modern pieces, they have a number of issues. 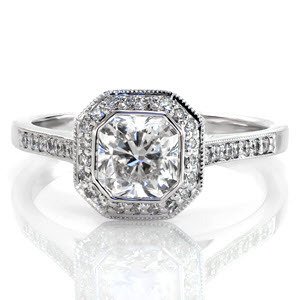 In particular, prong settings allow for their stones to be more susceptible to accidental rubbing or damage; furthermore, these settings tend to be less secure overall. While the possibility of stone dis-lodgement through even intense activity is minimal, bezel settings make this risk practically nonexistent. These are just a few of the reasons why our handcrafted full bezel engagement rings and wedding bands have been supremely popular with our customers. 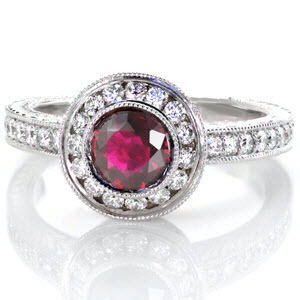 Some of the very first settings in the history of the profession used the bezel technique to perfectly fit and protect the beautiful gemstones of the eras past. 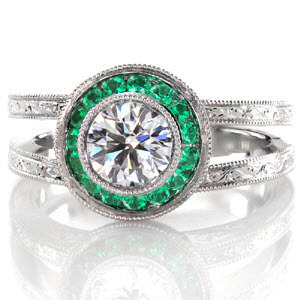 For thousands of years, the bezel setting served as the one and only setting used by jewelers due to its feasibility with the tools and implements of those times. 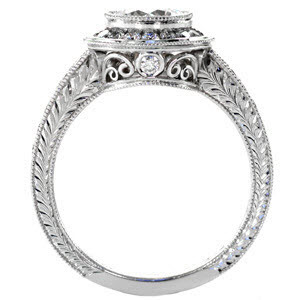 Essentially, an ancient jeweler might have fashioned a bezel setting by taking a piece of metal, whether gold, silver, or other, and fabricating it so that it matches the outer shape of the center stone. 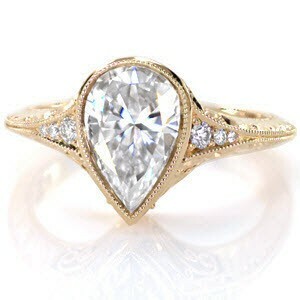 Then, the jeweler would place the stone within the bezel and “push” the metal over the stone so as to encompass it. 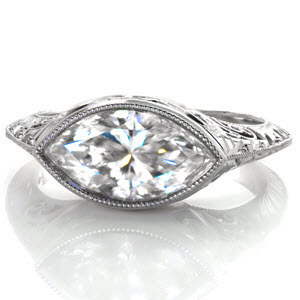 This technique has largely remained unchanged throughout the ages, and it still requires many years to master the pushing of the metal to just the right amount over the center stone so that it is not only secure, but also concealed as little as possible. * Protection: Due to the seamless nature of a bezel setting, the stones contained therein are protected from many types of accidental damage. * Versatility: Bezel settings look great with a variety of different band styles and stone cuts, as evidenced by our examples below. 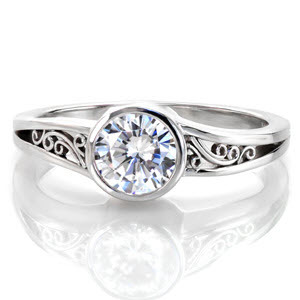 * Snag-proof: Unlike prong settings, when a bezel setting gets damaged it is not likely to move away from the stone in a way that will leave the metal exposed to accidentally scratch someone or snag on things. 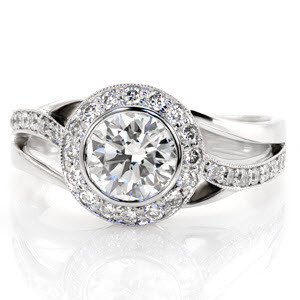 * Radiant Enchantment: With micro pavé stones stones forming a stunning halo around the center bezel setting of this beautiful ring, Radiant Enchantment surely lives up to its name. This piece in particular shows how bezel settings can be combined with halos and other silhouettes to create truly stunning jewelry. 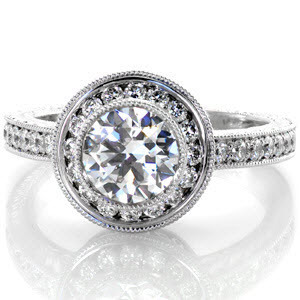 * Monarch: The proud, noble Monarch ring showcases the exquisite combination of a round center stone, round bezel setting, and a lovely micro pavé band. 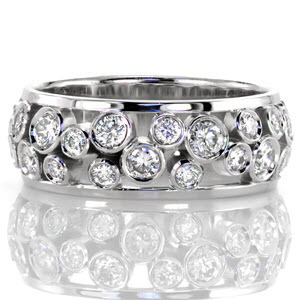 Truly, this 14k white gold band is fit for nobility of the highest prestige. 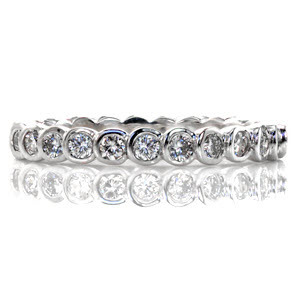 * Bezel Step Eternity: Our innovative and elegant Bezel Step Eternity band takes the classic bezel setting design to a new level. 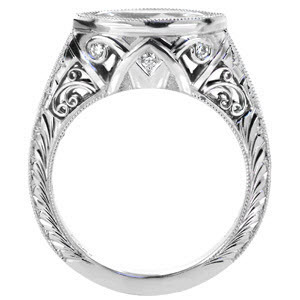 A seamless, interlocking 14k white gold band of bezel round brilliant diamond settings makes this ring a truly unique and novel design not seen elsewhere. 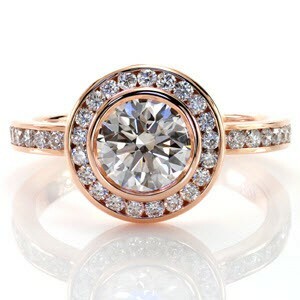 A bezel setting is a fantastic choice of setting for the center stone of your wedding band or engagement ring. If you would like to learn more about using a bezel setting in a band for that special someone, please get in touch with us today. We look forward to discussing your plans with you!